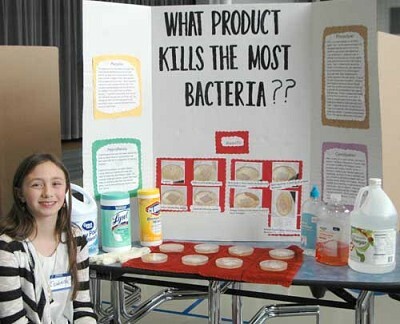 Isabelle Doherty, a fourth grader, displays her experiment, �What Product Kills the Most Bacteria?� for Bear Cave Intermediate School�s annual Science Fair on Friday, March 29. She tested soap and water, vinegar, bleach, hand sanitizer and more. 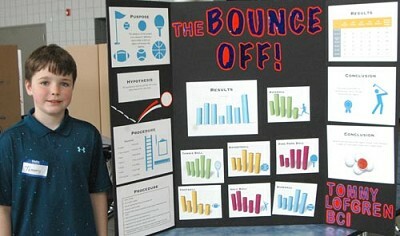 Tommy Lofgren, a fourth grader, conducted an experiment, �The Bounce Off,� during which he tested whether a tennis ball, basketball, baseball, Ping-Pong ball, golf ball, football or kickball would bounce the highest. Isabelle Doherty is concerned about keeping the members of her family healthy. "I come from a large family, and it seems like when one of us gets sick, we all get sick," she said. For more on this story pick up your copy of the April 9 Stewartville STAR.